Do not misunderstand me. I said there is no electron movement in electrolyte. Current moves in three forms. Electrons in wire/conductive solids or ions in electrolyte. It is still current. The electrons are forcing the the ion movement so you can measure this with your amp meter. The electrons do not jump off into the electrolyte so to speak. I am not an electrician but I do understand the two basic types of current. Now in plasma both electrons and ions move. In a reactor the ions are moving both ways and if they collide they become neutral and of no value to us. "The anode of an electrolytic cell is positive (cathode is negative), since the anode attracts anions from the solution. However, the anode of a galvanic cell is negatively charged, since the spontaneous oxidation at the anode is the source of the cell's electrons or negative charge. 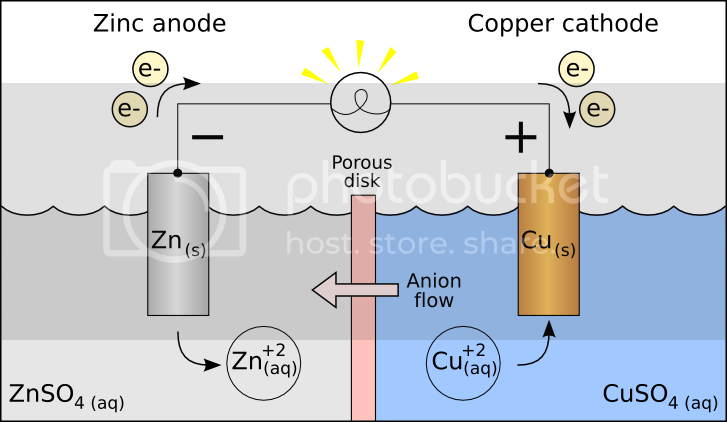 The cathode of a galvanic cell is its positive terminal. In both galvanic and electrolytic cells, oxidation takes place at the anode and electrons flow from the anode to the cathode." Carter was right again: in the cell due the presence of ionic and not electric conductor we may have ions who may moves in both directions - depend on electrolyte. hmmmmmmm.... Carter..... please answer me this. If there is no current flowing in the cell, why is it we can measure amperage on the positive and negative terminals of the cell? Just to make one thing clear here. There is no electron movement in the electrolyte. Ions are moving. They are being pushed and pulled by the anode and cathode. That means they the Ions are moving both ways. Let me see if I understand what you are saying. Sometimes the written words do not convey full thoughts. If I understand you correctly, you agree that current flows from the negative terminal to the positive terminal. Now, are you saying that once the current reaches the negative terminal on our cell it somehow stops and that current from the positive terminal reverses course and flows to the negative terminal? That's what I'm understanding you to say from your last remark. Polarity on battery is as you said: from negative to positive. On electrolytic cell electrons arrive on positive pole (anode) and flow to ground ( cathode). I understand now where your confusion come from: the cell was designed by someone else,,ask him! Is a fine engineer for sure! Nice design! If your team are interested we may exchange some information's and eventually you may give a try on my electrolyte formula or even some of my other components. Take a look to my page..I may have one of the best solutions for a fuel saver. I have to give credit. The cell design is not mine. That cell was designed by Ed Grimm a one time NASA shuttle technician and meticulous designer! Uhhhh... check your electrical theory. DC current flows from negative to positive! Don't believe me, google it up!